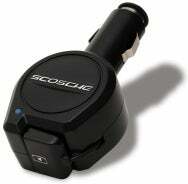 iPod and iPhone accessory vendor Scosche has released ReCoil, a car-charging solution that connects to your vehicle's 12-Volt accessory jack ("cigarette lighter" socket) and charges an iPod or iPhone via a built-in dock-connector cable. Unlike with most car chargers, the ReCoil's cable retracts into the body of the charger when not in use; a magnet keeps the dock-connector plug in place. The $30 ReCoil is Made for iPod- and Made for iPhone-certified.